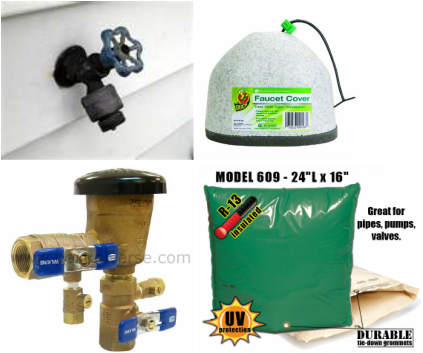 This section of our website provides information on regular maintenance items for your home. These procedures will help maintain your home's safety, comfort , life expectancy and preserve the value of your property as well as reducing the risk of incidents. The selection of topics is tailored to properties located in Southern Nevada. Please let us know if you have a suggestion for a new topic. Seasonal test. 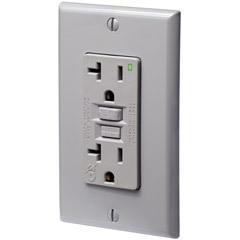 This type of outlet is installed to improve the safety of your home. You'll find these where the risk of electrocution is higher such as in the kitchen, bathrooms, laundry room, garage, exterior, etc. This type of power outlet detects a current leak to ground and will turn the power OFF if a leak is detected. To test the device, push the test button and the device should pop and the outlet should turn OFF. To reset, press the reset button on the outlet. If the unit does not turn OFF or turn back ON as expected, the GFI power outlet should be replaced. 2) Heating and cooling systems. Dirty filters will restrict the airflow to your HVAC system, therefore reducing it's efficiency. Replace the filters as necessary. For homes in Southern Nevada, the most important change is in the spring before the warm season starts and in the fall prior to the heating season. To learn more about the basic primary air filters read the notes in article 13 on this page. Many homes have more than the primary air filters. Besides the standard filters that you can access from inside your home, many systems have additional filters in the home near the system fan. 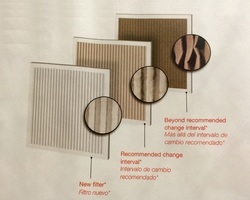 If your system is equipped with an electrostatic filter (see picture), you will have two additional filtration layers. 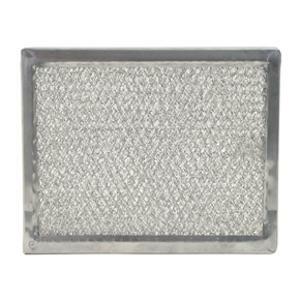 A metallic mesh pre-filter which looks similar to a filter typically found at your kitchen stove exhaust fan and the electrostatic filters which is a cell or assembly of metal plates and wires using high voltage to charge and collect fine particles as they travel through the filter cell. Electrostatic air cleaners must be cleaned properly and regularly to maintain their peak performance. Follow the manufacturer's recommendation on how to clean the filter cells. 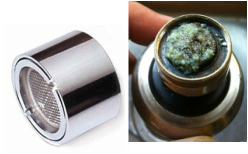 It is very important to allow the cells to dry completely before turning the filter back ON. On the outside of your home is the heart of your cooling system. Most diagnostics and servicing tasks should be performed by licensed HVAC technicians however, there are some preventive maintenance tasks homeowners can do. 1) Check the insulation of the refrigerant lines for damage. 2) Remove leaves and any debris around the unit to avoid any obstruction to the air flow. 3) Ensure that the unit is clean, use a garden hose as necessary to remove any dirt or obstruction on the unit's coils. The unit's coils and fins can be damaged easily, do not use significant force or hard brushes while cleaning. Seasonal visual check. These weep holes allow rain to be directed outward from your house and allow your house to "breathe". Fireplaces, stove exhaust fans, bathrooms exhaust fans and clothes dryers use internal air which must be replaced. Weep holes can become clogged by dust or bugs. Keep your windows tracks free of dirt and debris by vacuuming or brushing away the debris. If the windows weep holes have been closed by caulking, remove the caulk to clear the holes. Monthly visual check. Grease and dust can restrict the flow of the exhaust fan, therefore affecting it's ability to exhaust steam, smoke and odors. If your filter is similar to the unit shown, remove it and soak it in warm soapy water. Spraying the unit with a degreaser may help and scrub as necessary. Let the unit dry and reinstall it. If the filter is damaged or bent out of shape, replace it. 6) Is your locked door the most vulnerable entry point of your house? Photo 1 - Broken Door Jam by a single hit. Photo 2 - reinforced door jam and plate. Photo 3 - Reinforced door. The parts are available at most home improvement stores. These improvements are not indestructible but it will certainly take a very heavy hit to break in. Seasonal check. A good weather strip will prevent most dust and water intrusion into your home. Overtime, your current weather stripping will degrade, wear out and be damaged by normal activities. 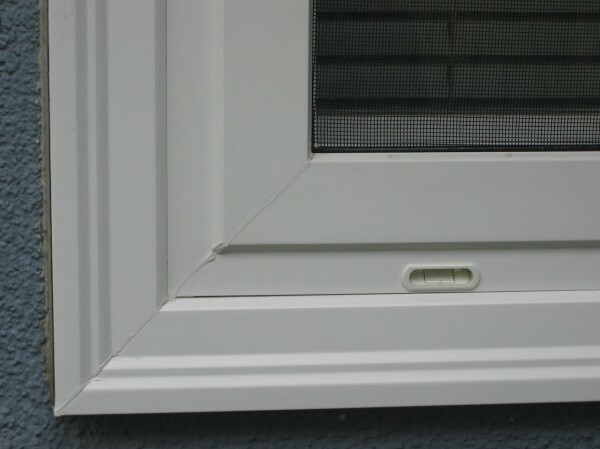 A good method to check weather stripping is to observe the gap around the door in full daylight from inside your home. If you see dust on the floor at the bottom of the door or any daylight from inside your home, the weatherstripping may be damaged and not be sealing properly anymore. 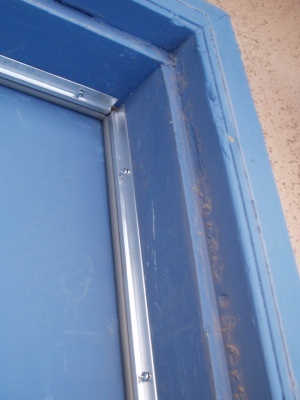 Most door weatherstripping can be adjusted or replaced as necessary. If you need to replace the strip at the bottom of the door, follow this link for hints on how to do it. Very few people know that in order to keep your water heater running properly and efficiently, very simple maintenance procedures should be performed. The Pressure and Temperature relief valve should operate freely (see picture). To test it, lift and keep it open for 5 seconds and check the discharge at the drain pipe. After the test, the valve should close and the water flow should stop. If it does not stop, open and close the valve several times. 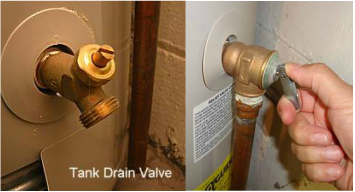 If the valve does not open or the water flow does not stop, the valve should be replaced. Settled sediments inside the tank can cause burners to work longer to heat the water. If not addressed they can allow your tank to rust and slowly be eaten away until you need to replace the entire unit which is very costly yet easily preventable. A quick way to avoid problems is to occasionally (quarterly) test your T&P valve and perform a mini-flush. be careful, the water is very hot. First, hook-up a garden hose to the bottom of the tank (see picture) or use a bucket, then open the drain valve. Let it run a for a couple minutes or until the water is clear and you are done. For a yearly thorough cleaning, you should perform a complete drainage of the tank as explained here. To save energy, adjust the water temperature no higher than 120 to 130F and insulate all pipes to the water heater for about 5 feet. This will reduce the energy loss to the ambient air. 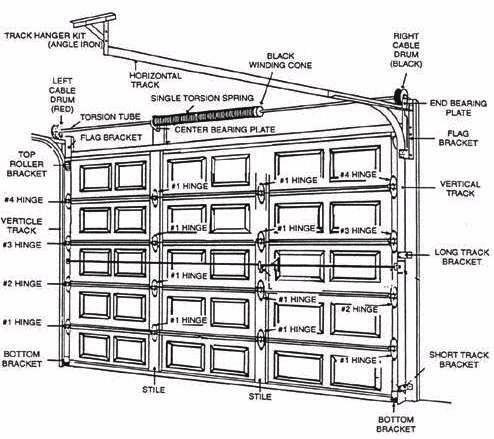 A garage door should give you several years of reliable service but there are a few maintenance items you can do to extend it's life or to prevent failures. One of the most important is lubrication. If your door is noisy, cracks or squeaks chances are it could use some TLC. Check for any loose hinges, wheels or support fasteners on each side of the door and near the door opener. Wheels, bearings and springs need lubrication for smooth operation. As you see on this picture, there are several wheels and hinges between door panels. The springs are at the top as well as the cable pulleys. The following video from Lowe's will guide you on how to do this. If your garage door opener is a chain or screw drive, it may need lubrication too. Use a light oil or specialty garage door grease as lubricant. A word of caution, if you see any frayed cables of damaged pulleys or springs, do not attempt to repair yourself, for your safety, significant repairs should be done by following specific procedures with the proper tools by trained qualified personnel. Can you see your address sign clearly from the street? In an emergency, every second is important. It is critical that your address sign is visible and properly lit after sunset. 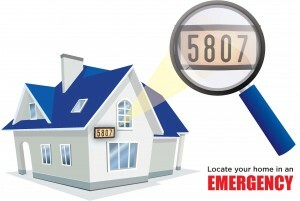 When the fire department, police department, an ambulance or even a delivery service needs to identify a specific property, they must see the address sign clearly. For this reason, Homeowners Associations may inspect the signs and request that the sign be visible and lit. There are several types of signs and bulbs. If you need to replace the bulbs, check with the manufacturer of the sign to see if they have LED bulbs for your specific sign. The LED bulbs are typically brighter and the life expectancy is 7 to 10 times longer than a regular incandescent bulb. Although winters are not very cold in southern Nevada, we may have a few nights when the outside temperature goes below the freezing point. Beside fragile plants, your exposed water lines and certain types of spigots like the one on the picture should have freezing protection. The pictures show a sample of what is available from most hardware store. The spigot foam cover is cheap and easy to install. They need to be snug to the wall. If not use a faucet sock also found at the hardware stores. The irrigation system vacuum breaker should be covered by adequate insulation. There are many ways this can be done. The picture shows an insulated bag that slips over the vacuum breaker and hopefully all the way down to the ground. If not, ensure that the exposed pipes are covered with pipe insulation. Never leave a garden hose connected to any exterior faucet during the winter. The hose will prevent the spigot from draining properly and increase the chances of water freezing in the spigot and cause very costly plumbing repairs. If your coach lights or occupancy lights are turned on from dusk to dawn from a light sensor or a timer, your lights will burn approximately 4,000 hours a year. Burning one 60 watts incandescent light bulb for 4,000 hours will cost approximately $17 in energy. If you replaced them with a CFL bulbs, the life expectancy more than doubles and your cost per year will reduce to less than half. Recently the LED light bulbs have become very popular for two good reasons. The life expectancy can be near 25,000 hour which means six years of service and the operating cost is very low. A 60 Watt equivalent LED light bulb will cost only $2.50 in energy per year which means a $14.50 savings each year. ﻿﻿﻿In order to protect your home heating and cooling equipment and to help maintain good air quality, your filters should be changed on a regular basis, but how often? The picture gives you a good hint on when to change your filters. Do not wait until they get very dirty and start to collapse. At the very minimum, the filters should be changed at the beginning of the cooling and heating seasons to get the best efficiency out of your heating and cooling systems. The filters will easily pay for themselves in energy savings. If someone lives in the house on a daily basis or if you have pets, the filters should be changed more frequently, at least every quarter. Home Watcher LV assumes no responsibility for the content herein. The content is intended to provide general guidance. It is the responsibility of the reader to verify compliance with any laws, codes and regulations. For any concerns, please consult the manufacturer or a licenced professional.